New Wilmington Art Association (NWAA) — the collection of contemporary artists responsible for bringing edgy, exciting works to Wilmington's visual arts scene — is back and excited to begin a new season! They’re already preparing for their first show. NWAA also welcomes four new co-directors who will head up the organization: Anne Yoncha, William Slowik, Jessica Taylor, Brian Scatasti. 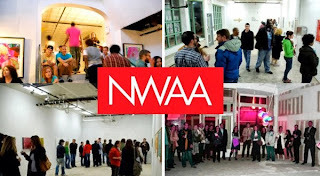 Please note the email address for NWAA has changed: new.wilm.art@gmail.com to contact them & submit work for the DEBUT 2014 SHOW — FREE and OPEN TO ALL. See http://thenwaa.org or CLICK HERE for the Facebook Page.